Do you have feet? If so, foot care should be important to you. The truth of the matter, though, is that too many people neglect those valuable appendages. Over time, this can become a problem for otherwise healthy individuals (including those who stay physically active for cardiovascular and weight maintenance purposes). When diabetes is in the picture, the importance of foot care is heightened. Knowing how to keep your feet safe and seeking early treatment for issues is essential for preventing major complications from developing. 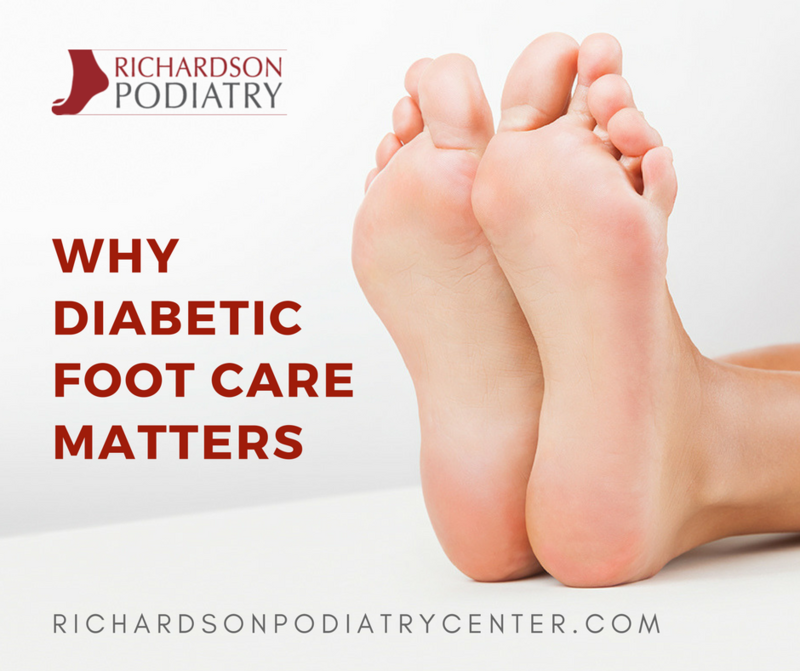 As we look at potential problems that are more common for diabetic patients, you will quickly understand why diabetic foot care matters. Neuropathy. Elevated blood sugar levels can damage peripheral nerves – the ones responsible for communicating physical sensations to the central nervous system (brain and spinal column). Symptoms may include painful, phantom sensory experiences, but also numbness. If your nerves are unable to feel and transmit pain signals to the brain, it’s possible to sustain damage or an injury without knowing (and then addressing the problem). Circulation problems. In addition to nerve damage, diabetes can also cause and contribute to poor blood circulation. When the tissues in the feet (bones, muscles, connective tissues) do not receive appropriate levels of oxygen and nourishment, they weaken and are unable to mend as they should. Combined with neuropathy, this can potentially result in Charcot foot. Increased risk of infection. One more problem with elevated sugar levels is the fact it impairs the immune system. Elevated blood sugar has an effect on white blood cells – the ones our bodies use to fight off contaminants (bacteria, viruses) that cause infection. Foot ulcers. Out of the various ways diabetes affects feet, diabetic foot ulcers are the most concerning. When ulcers—skin and tissue breakdown—form, they can ultimately lead to gangrene. This is an irreversible tissue death that spreads unless it is addressed. Unfortunately, the only way to take care of the problem is through amputation. If you are diabetic, you need to protect your feet and have issues addressed at the earliest possible opportunity. It can be difficult to know what is entailed with a comprehensive diabetic foot care plan, but we are here to help! Call Richardson Podiatry Center at (972) 690-5374 or contact us online right now. Together, we can identify the measures you need to follow for optimal foot health and safety. ?Will Exercise Affect my Diabetes? ?Is Wearing Shoes Necessary with Diabetes? ?Why Do Diabetics Need to Wear Shoes?